@bryanb i have the same opinion as you. Raw video (more quality) or encoded video to match the youtube settings it almost make no difference at all. Slightly difference that i notice the raw video more blury and pixelized in some parts (maybe light transitions). Both videos are far away from the original ones, Raw and encoded, before uploading. Here’s an example of YT chewing up a 1080@video. Look at this at 4K and again at 1080. The 4K playback is very close to the original, shot at 1080. Look at the 1080 playback and, in particular, look at the road seen through the windscreen. The original (4K playback) doesn’t have problems with pixelation. It’s an artifact added by YT. What export setting did you use for 4k? IIRC I used YouTube with the resolution bumped up to 4K and the frame rate to 60 fps. But that’s a guess. It’s been a while since I’ve posted anything. Probably for the best results, first set your Video Mode to a 4k resolution at the correct fps for your source video. Then import your video. 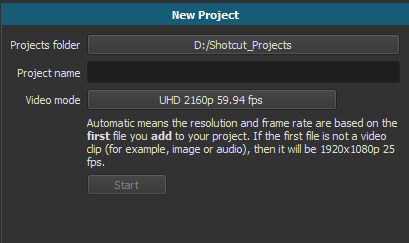 I tried importing a video using your suggestion and then exporting, and when Shotcut imported, it was still at 1920x1080. So, I imported the video as normal i.e. default resolution of 1920x1080, but I exported it as 3840x2160. So basically you recorded it at 1080p, encoded it to 4k and upload it at 4k right? FWIW, I’ve been playing around with YouTube uploads and I seem to get a cleaner image by converting from 4;2:0 to 4:2:2 before uploading. I don’t know if this is coincidence or something weird about the way YouTube’s transcoding interacts with the video, but they are cleaner if first converted to 4:2:2. The video comes out of my camcorder at 4:2:0. New video uploaded at 2160: https://www.youtube.com/watch?v=aFt6YwCnhCw (view at 1080p). From about 12 to 13 mins in is a good comparison. To me the 4K upload is visibly better. The trees in particular look sharper. Hi there! Thanks for your URL re YouTube. Much appreciated! There is far too much lens flare. YouTube is matching the video to my display resolution of 720 x 1280. You don’t get the option of 1080p ? I really don’t get youtube?